Back in the day, when RJ Ross was a singer and keyboardist with various funk groups in his native Detroit, his seriousness about music and expertise at running rehearsals earned him the nickname “Professor.” Truth is, the stylish multi-talented performer doesn’t have a formal classroom or boast any fancy degrees on the wall. But when it comes to creating brilliantly cool contemporary soul-jazz, Professor RJ Ross and The University of Soul are showing the youngsters how it’s done. Emerging as a solo artist after several busy decades behind the scenes, the soulful musical innovator—who’s been working professionally since age 11—brings a lifetime of funky music, hard knocks and hard hitting stories about triumphs over adversity to his easy grooving debut album Face to Face. Produced by Jerry Stucker (Chuck Prophet), Ross’ infectious new collection featuring eight originals and six artfully arranged classic cover songs was recorded at the legendary Capitol Studios in Hollywood with a guy who knows a little something about how to make a Grammy winning jazz recording: legendary engineer Al Schmitt, who has worked with George Benson, Steely Dan, Ray Charles, Diana Krall, et al). Grammy winner Ed Cherney (Bonnie Raitt, Michael McDonald) mixed the album at The Village in Los Angeles. One of the top MIDI experts in the Bay Area, Ross’ background includes a lengthy stint at the world famous Fantasy Studios in Berkeley, where he brought his MIDI magic, keyboard and arranging skills to projects by everyone from Jeffrey Osborne and Eddie Money to Huey Lewis, MC Hammer and 2Pac. So now that class is in session, it’s no surprise that he’s brought a host of top visiting “lecturers” in as the University of Soul’s faculty. Complementing Ross’ deep, sensuous vocals, piano and keyboards on Face to Face are drummers James Gadson (Donald Fagen, Marvin Gaye) and Steve Gadd (Michael McDonald, George Benson); bassist Freddie Washington (Simon & Garfunkel, Michael Jackson); B3 organist Neil Larsen (Aaron Neville, Al Jarreau); tenor and soprano sax player Ernie Watts (Steely Dan, Dr. John). The recording’s other musical contributors have worked with everyone from Grover Washington, Jr., J-Lo and Santana to Elton John, Herbie Hancock, Tower of Power and Talking Heads. While Ross’ compelling and highly personal self-penned songs are the emotional core of Face To Face, his unique take on America’s “Ventura Highway” is already popping at smooth jazz stations and the timeless Johnny Mercer chestnut “Autumn Leaves” is being spun on traditional jazz outlets. In composing his original material, Ross was inspired by a very trying time in his life. Nine years ago, just after deciding to move out of the shadows and begin pursuing a solo career, Ross was diagnosed with a rare form of stage IV cancer and was thrust into what he calls “a roller coaster ride of heartbreaking joy and darkest despair.” Told his cancer was incurable and to “get his affairs in order,” Ross, who was running his own 24 track studio by that time, refused to accept that fate and set out on a quest to prove the doctors wrong. His subsequent courageous battle defied all odds, with redemption coming in the form of extremely risky and invasive surgeries—which eventually led to a successful outcome and a new lease on life. During that time, the vast changes in his life included closing his studio and buying a wonderful house surrounded by trees and bay vistas in the Berkeley Hills—while literally traveling the world seeking a cure. “If you look at the lyrical content of my original songs,” he says, “a lot of it is about finding myself, emerging through the fire and ultimately delivering an upbeat message about the sheer joy of being alive. The title song ‘Face To Face’ is about simply having the courage to face the reality of who you are, while ‘Like A Circle’ is a song about rebirth, of going through the darkness and coming out the other end. Many of the songs I write all have that theme of passing on a journey through immensely trying times while acknowledging the goodness of life. “As hard as I know life can be, this stuff I went through is what makes me the artist I am today,” Ross adds. “When I was very young, I had a lot going for me, things came easily to me, and I was a popular kid. So going through all these things helped me develop compassion towards what it’s like to be, as one of my song titles says, ‘The Outsider.’ The Persian poet Rumi says ‘the heart has to break for the heart to open,’ and I am pleased to say I have come back into the light with a great attitude and a much richer palette to draw from creatively than I would have otherwise. Fortunately, my producer, Jerry Stucker really saw who I was as an artist. He saw my potential and always believed in me. 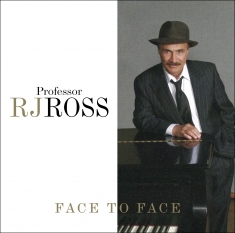 For everyone involved in this project, Face To Face is really the start of a long overdue musical blossoming, with the truly inimitable, instantly identifiable Professor RJ Ross starting the process with a vast musical repertoire that incorporates a lifetime of diverse musical influences. Despite the big names involved, the great creative freedom involved in creating the album makes it something of an ultimate Indie recording. Ross is currently focused on creating more video content of his live performances for YouTube and other online outlets.